The 2014-2015 season will mark Alexandre Burrows' 10th season in the league, all with the Vancouver Canucks. The left-handed forward was undrafted and fought his way through the QMJHL and the ECHL to crack the Canucks line-up. His highest scoring season was the 2009-2010 campaign where he scored 67 points (35G 32A) in all 82 games. In the next two season, Burrows would average 50 points a season (48 points, and 52 points, respectively) all while registering a shooting percent all around 15%. In the lockout-shortened 2012-2013 season, Burrows scored 24 points (13G 11A) in 47 games played, with a 9.3% shooting. So I think the biggest question Canuck (and non-Canuck) fans are asking is, what the heck happened last season? We had seen 4 straight 20+ goal seasons, and a season, if fully played where Burrows might have hit 20 goals, and then the 2013-2014 season, where Burrows scored 15 points (5G 10A) in 49 games. So let's take a look into the numbers of what happened, because they are far more than what the conventional stats say. In the very first game of the season, the Canucks were playing the San Jose Sharks when Burrows dove to block a slapshot during a San Jose 5-on-3 advantage. While out for a couple weeks, Burrows was injured when a puck hit him in the face while on the penalty kill in a December game against the Carolina Hurricanes. So the answer is simple, right? We take Burrows off the penalty kill unit, and all will be dandy...Except it's not that simple. While he was on the ice last season, Burrows was a solid staple on the penalty kill. Of all the forwards who averaged over 1:00 of penalty kill (4-on-5) time per game (60 min), Burrows was 2nd on the team in blocked shots for, with 26.1/60, which averages to 0.87 blocks per 2 minutes of penalty kill ice time. To put into perspective, the leader on the team (who falls under the aforementioned parameters) was Christopher Higgins, who averaged 28.1 blocks/60. This averages to .94/2. And while it's important to note that Burrows' on-ice corsi during the penalty kill was worse than his off-ice corsi (-82.30% vs. -67.45%), keep in mind that of the forwards on the Canucks who averaged more than 1:00 of penalty kill ice time per game, Burrows had the second-highest QOC rating, which is a statistical look at the on-ice competition a player faces. I will saw though, that this stat alone is a bit flawed because taking out the average time requirement, Burrows' QOC rating was 5th on the team. I say this because the three players directly above Burrows, David Booth, Zac Dalpe, and Zack Kassian, all had average ice times of less than 0.10 minutes (less than 6 seconds of penalty kill ice time) per game. They averaged 0.05, 0.03, and 0.01 minutes, respectively. If you're curious for more stats, you can follow this link to BehindtheNet, where I got all the information. This is a player usage chart I got fromSomeKindOfNinja. In case you haven't read any of my articles, I love player usage charts simply because of the visual aspect of a tremendous number of statistics they show. Let's break this one down! This is a chart depicting 5-on-5 (even strength) stats including offensive zone start%, QOC and Corsi R%. Each player is represented by a circle. Do you see Burrows' circle? 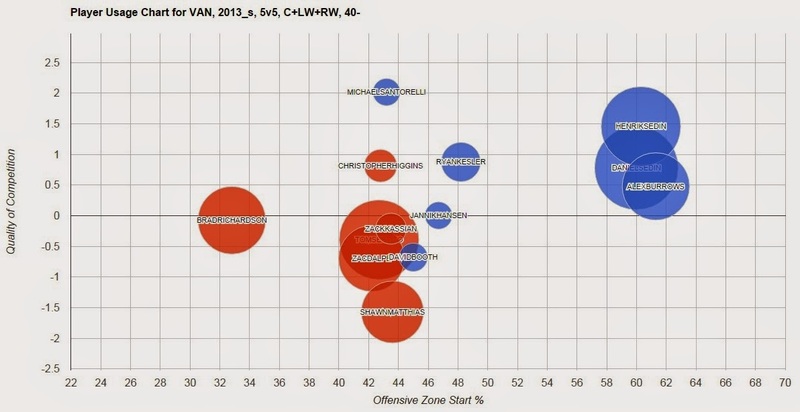 It's all the way on the right, right near his line-mates for most of last season, Henrik and Daniel Sedin. The further right a player's circle is means the higher percentage of offensive zone starts. The higher up on the y-axis for a circle is indicative of higher Quality of Competition a player faced. If a circle is blue, then the player has a positive corsi rating, while a red circle means the player has a negative corsi rating. The smaller a circle is is indicative of a Corsi Relative% closer to 0. So it's better to have a large blue circle than a large red circle. There is a positive correlation between higher offensive zone start percentage and corsi percent, and I will elaborate on that a bit later. Burrows had the 6th highest Quality of Competition rating (0.48), while having the highest offensive zone start percentage (61.3%). Burrows' standard Corsi% average for his entire career (ignoring zone-start) is 54.6%. So this past season's number, 56%, while lower than the two previous seasons (58.4% and 58% respectively), was higher than his career average. Since a high number of offensive zone starts can inflate a player's overall Corsi, there is a way to compare all player corsis, despite the number of offensive zone starts. This is called Zone-start adjusted Corsi. Burrows' ZSACorsi from last season was 53.966%. I am having trouble finding any seasonal summary of Burrows' zone exit/entry as well as passing distribution stats, which is too bad (If anybody has some, would you mind sharing?). While zone exit stats focus more on defensemen, zone entry stats are more indicative for forwards. One more stat I'd like to look at is PDO, which is essentially a measurement of on-ice "luck". It combines on-ice save percentage and on-ice shooting percent. A score of 1000 is considered normal, while anything above 1000 is considered lucky, and anything below it, unlucky. Burrows' career PDO is roughly 1016, which is above-average in the quantified luck department. His PDO from the past season was 970, his career lowest, and 10th lowest in the league last season. So the reason for Burrows' struggles last season was a combination of a series of injuries, strong defensive role and playing tough competition (Burrows was tied for 3rd on the team in QOC TOI% with 29.2%), and incredibly, almost comically, bad luck when shooting the puck towards the net (second lowest season shooting percentage in his career). Do I think Alex Burrows will bounce back? Of course, the numbers are all pointing to it! Now I don't think his offensive numbers will bounce back to right where they were, considering the fact that he might still be a bit rusty, and that he will most likely play on the second line of Vancouver, with Nick Bonino as center. Playing on the second line will help Burrows' bounce-back because his competition won't be as tough on the ice. Pre-season is just about here, and every Canuck fan is looking forward to a bounce-back season from Alexandre Burrows.